Our unique enclave on the scenic Hemel-en-Aarde Ridge is a sought-after wine destination where a warm welcome awaits young and old. Ranging from our knowledgeable and attentive staff and our world-famous Wine and Food Pairing options to elegant touches such as our superior Riedel glassware – everything combines to offer our guests a truly memorable experience. And that includes our younger visitors for whom we cater with a special Young Adults Menu as well as their very own Kiddies Pairing! Daily between 10H00 and 17H00. Creation periodically showcases the works of leading South African artists. For more information, please contact us. Daily between 11H00 and 16H00. An attractive variety of flexible options are available for private parties and business events. For more information, please contact us. Creation Wines takes pleasure in inviting you to our little piece of paradise. The following activities have been specially designed for wine lovers and those who appreciate the finer things in life. Please book beforehand to avoid disappointment! As the name suggests it brings a feast of fabulous flavours to the table, all artfully orchestrated with our wines to make the taste buds hum with pleasure! In the spirit of spring renewal, the Creation Culinary Team brings you five delectable courses artfully paired with eight award-winning wines. Fresh, locally sourced produce and inventive combinations are imaginatively presented to offer a unique taste adventure. Another thrilling newcomer is the Small Plate Pairing Menu which will change weekly. This is where our chefs will let their creativity run wild, incorporating fresh local ingredients and unexpected combinations into no less than six different small plate courses, each enjoyed with a different wine. This option will replace our existing à la carte menu. Savour the spirit of Creation with Passion, Charisma, Resonance and Déjà Vu … Yes, the perennial debate surrounding the contentious pairing of wine and chocolate has inspired Creation to bring you our own Paradoxical Wine and Chocolate Pairing. Velvety smooth chocolates for optimal mouth-feel … sensuous flavour profiling to offer you four fabulous matches. Irresistible? For sure! Ranging from our award-winning Estate and Reserve wines to the iconic Art of Creation wines, our portfolio is pure delight to the palate! Join us for a tasting in our attractive Tasting Room with a knowledgeable host in attendance. 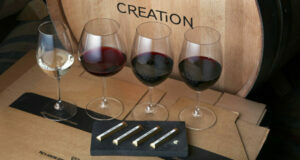 Creation Wines: Creation Reserve Wines: R15 per wine; Creation Art of Chardonnay and Art of Pinot Noir: R25 per wine. 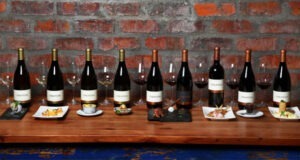 Creation Estate Wines: R10 per wine. In line with Creation’s ethos of constant innovation, the team has introduced an exciting new Brunch Pairing Menu comprising five of its award-winning wines, each matched with a delectable dish. Do you want to challenge your senses and treat your palate to the extraordinary? Then book now for the new 10AM Brunch Pairing. In the spirit of innovation and inclusivity, Creation has partnered with the luxury TWG Tea brand to develop a tea and food pairing that runs parallel to our perfect with our Story of Creation pairing. Amazingly aromatic and richly rewarding – ideal for designated drivers, expectant moms and those who abstain for religious reasons. Specially designed so that children between the ages of 5 and 12 can experience the wonder of flavour profiling. 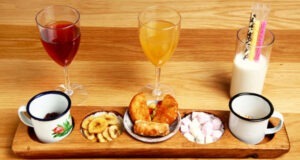 The Kiddies Pairing includes juices, flavoured milks and a selection of healthy nibbles for experimentation. Creation’s beautifully appointed Tasting Room offers the ideal venue for prestigious corporate functions and an exciting diversity of activities is available to corporate groups. Tailor-made packages range from lunch and dinner with the menu of your choice in our Tasting Room to Wine and Food Pairing in your own boardroom or any other venue of your choice in any of the country’s major cities. Our knowledgeable wine ambassadors will host your function and ensure a most memorable event. Planning a visit? Use the below booking form to reserve your table and receive instant confirmation. Don’t forget to let us know about any special occasions or requirements. Our Tasting Room offers no less than 7 pairing options – from The Story of Creation to our Paradoxical Wine & Chocolate Pairing and the exciting 10am Brunch Pairing. 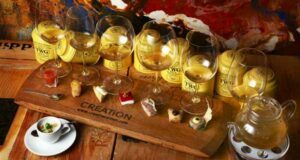 For special requests, please email reservations@creationwines.com or call us on +27 28 212 1107. Thanks! Booking is essential. Available 10h00 (latest 10h30). Deposit required. Share your experience at Creation with potential visitors on our website Guestbook or post a review and give us a rating on Tripadvisor. Haven’t visited us before? Have a look at what others say about our wines, food and their time with us. Creation – the one stop station for your culinary expectation and sensation. Each of your senses are enticed and delighted from a vibe of style, culture, art, cuisine, vino and ambiance. What a pleasure to see Carolyn dealing with her clientele in such an elegant sophisticated manner – a standard of execution that is followed by her staff. Stephanie rocks! Great compliment to the chef and his team!! I was completely blown away with the 8 Tapas pairing. What amazing service, and a breathtaking view. The food was exceptional! I would recommend this to anyone and will definitely be back again soon. Possibly one of the best wine experiences of my life. Yesterday I took my girlfriend to creation for our 1-year anniversary and let’s just say that these guys absolutely had my back. Perfect wine paired with perfect food. Can’t wait to come back! 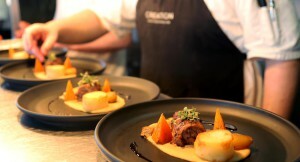 22 Aug 2014, unreal food & wine experience – I am going back this August;). Drank en kos uiters goed, wynproe uitstekend en mooiste uitsig. Exceptional service, the best white wine in the world by far. Outstanding people attending to the wine tasting. So glad we were recommended to come to Creation. Truly wonderful lunch, great wine, great staff, and unsurpassed view. Thank you. 5* for the service, 5* for the wine, 5* for the food. Beautiful setting, welcoming atmosphere! I visited Creation Wines for the first time yesterday. It is an absolutely beautiful place, and all the staff made me feel very welcome and at home. I highly recommend this trip to all seeking an authentic South African wine experience! We had the opportunity to experience a wine and food pairing on a rainy afternoon and it was fantastic. For the driver, the tasting was Tea and food with the same level of excellence. It was so good that we continued with the wine and chocolate pairing. Excellent wines, fantastic ambiance. Excellent service & experience. 1000 thumbs up for excellent service by waitress Pamela and an excellent wine & food pairing experience!!! We took some friends to the Cape for a wine week, Creation was the highlight of that special time! great wines and the food pairings were really wonderful, keep it up guys! Had a very nice time. Wines and food were great compliments to each other. Only problem was our lunch was given away to another table. When we asked about our food, we found out another table had gotten our meal. Twenty minutes later we were finally able to eat. Might be an idea to offer a glass of wine whilst people wait for their delayed food. 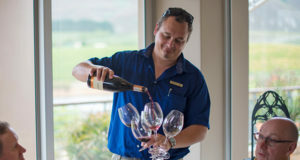 Our Guesthouse recommended that we visit Creation Wines in the Hemel en Aarde Valley, this place is simply stunning, the views fabulous, the wine tasting experience measured, friendly yet professional. We enjoyed a light meal of mushroom soup and the cheese platter, all using locally sourced ingredients and was simply delicious. A must visit when you are in the area. Thanks for lovely tasting, we look forward to our next visit! Popped in again to show a girl friend your venue as we were down from Pretoria. Pamela as friendly as usual. Glad your selection will be available at Woolworths. Regards Clifford. A stunning winters day with the sun on my back on the terrace of the creation wine tasting rooms. We chose the wine pairing menu with fascinating results, tasting our way through the range of wines from this relatively young vinyard in Hemelenaarde Valley. 2010 Sauvignon blanc served with Asian salmon dumpling and goats cheese cannelloni – worked well. 2011 Voignier – with chicken and apricot satay – better without food 2009 Merlot served with cauliflower soup with a nugget of creamy gorgonzola – the merlot was excellent with the creamy gorgonzola 2009 petit Verdot – a blend of Merlot and Cabernet sauvignon served with springbok filleted and cherry jelly – we decided Cabernet was not our preferred wine! 2009 Syrah served with chorizo empanada and duck and sour cherry pie. This worked very well both on its own, with and after the food – emerging as a good match for the dishes 2009 Grenache served with bobotie. Spring roll and beef carpaccio. Good but by this time we were not sure how long ones palate should hold out for these events. For desert we reverted to more gorgonzola and merlot before wending our way home through the Overberg to a well deserved siesta! Outstanding experience. Compliments to staff and professional service. Especially to Phillip, whose descriptions made the tasting so much more enticing. Amazing wine tasting experience! I would highly recommend the wine paring. Definitely going back for another visit. Thank you for a wonderful visit – what a little piece of paradise – we loved our visit! Had not heard about this wine farm before but what an amazing treat! Awesome wines, various great snacks to pair and beautiful view. 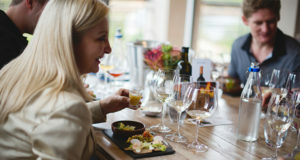 Try the wine pairing canapés- 8 course canapés paired with wines! Great value, fresh homegrown local ingredients and unbelievable wines. A new favorite of mine! What a wonderful place. Stunning wines and we were given a wonderful personal tour of the “barrels” by Kevin. The service and staff were excellent. Quite simply the best winery we visited in the Cape!!! Do not miss this very special experience. Absolut empfehlenswert! Hallo Jean-Claude und Familie wieder zurück in der Schweiz denken wir gerne an unseren Besuch zurück. Zu Kapstadt gehört für uns in Zukunft auch ein Besuch von Creation! Grüsse aus der Schweiz! Absolutely worth the drive! Breathtaking views, inspiring interior design, and, most importantly, excellent wines and outstanding service. The wine is being described to you in a way that you do not need to taste any more, you will buy it automatically 🙂 This young winery has huge potential. Great wine, exellent experience. Keep going. Klassiek elegante wyne gemaak vir engine geleentheid wat steeds uitstaan bo die res! Had wonderful time. Great wine, great atmosphere and very child friendly. My three month old nephew loved the wine descriptions, never seen him so fascinated. Amazing. Good wines (esp. The merlot with the cauliflower soup), lovely views and fantastic, friendly service. We will be back. Excellente Weine! Kompliment! Werde diese Winefarm definitive weiter empfehlen! Subscribe to news & updates?